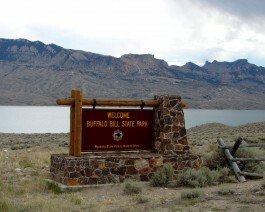 There are two developed campgrounds at Buffalo Bill State Park: NORTH SHORE BAY CAMPGROUND: which has 37 sites; 29 pull-through, 3 back-in and 5 designated tent-only. NORTH FORK CAMPGROUND: which has 62 sites; 56 pull-through and 6 designated tent-only sites. All campsites have tables and grills and are convenient to water hydrants and restrooms. Some hookups available. With the exception of those designated tent-only, campsites will accommodate trailers, tents or RVs. Roads and parking areas are paved. Open May-September. Pets welcome.